We have again to record another painful calamity that occurred yesterday morning in the lower part of the city which was attended with loss of life, while a number of persons being terribly injured. About 8 o’clock the Hall bell struck an alarm of fire for the eighth district. The fire originated on the first floor of the building No. 18 Morris-street, occupied as a grocery store, by Patrick Fitzsimmons, and owing to the flames spreading among the liquors they swept through the floor above with great fury and baffled all the exertions of the firemen for some time. The upper portion of the building was occupied by a large number of poor families, the children of whom were yet in their beds, and in consequence of the powerful streams of water that were played into the rooms, the occupants became bewildered, and some of them leaped from the windows to the icy side-walks, sustaining serious and probably fatal injuries. The fire was finally subdued and the contents and interior of the premises were found to be nearly destroyed. Elizabeth Arrey, aged 3 or 4 months. Anne Arrey, aged 8 or 9 years. A child of Sarah Crosby. Mrs. Crosby was also badly bruised, and was taken to the Hospital. Carrick Crosby fell from the second story window, and had his back broke. He was taken to the City Hospital, by Officer McCabe of the first Patrol District, and is beyond all hopes of recovery. Cornelius Towny fell from the second floor to the first, among the burning ruins, and was nearly burned to death. Conveyed to the Hospital. Mrs. Towney, (wife of Cornelius,) had her arm crushed by a fall, while endeavoring to save her two children, who were finally rescued from the devouring element alive, but were considerably burned about their faces, breast and arms. Mrs. Arrey, (wife of Thomas,) had her leg crushed by jumping from the upper story window; taken to the hospital by officer McCabe. A man by the name of John Woods, a printer, boarded in the house and is yet missing; fears are entertained that he has also perished in the flames. A lad named Henry Hickey, was also missing, but has since been found. The other tenants of the premises barely escaped with their lives, but afterwards were nearly frozen to death in the street, before they could be provided with shelter. 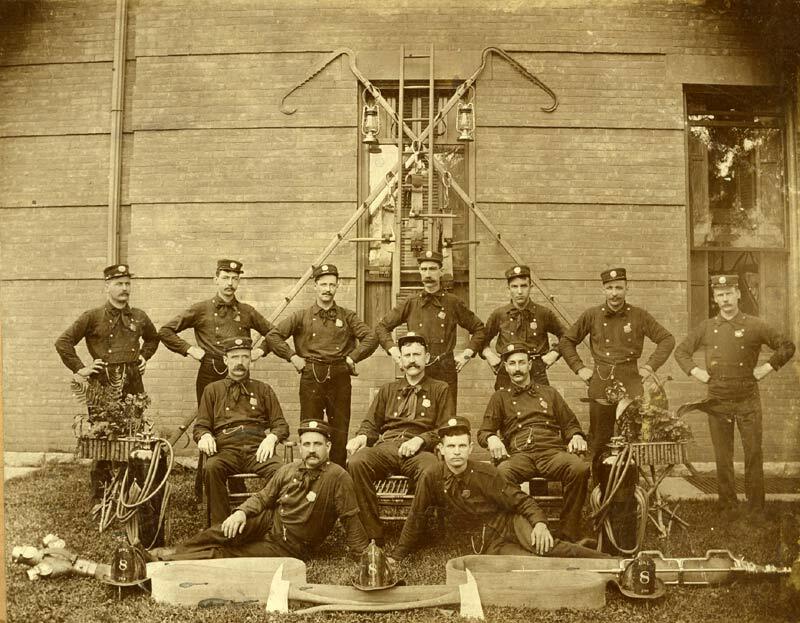 The fire department worked with great energy, and the poor houseless sufferers were rendered every assistance by Captains Silvey, Van Zandt, officer McCabe, and other members of the First Ward Police. After the remains of the mutilated bodies were extricated from the ruins they were conveyed to the First District Police Station, and inquests held upon them severally by Alderman Moore, who acted as Coroner, the verdicts of which in each case were in accordance with the facts and heart-rending circumstances as given above. 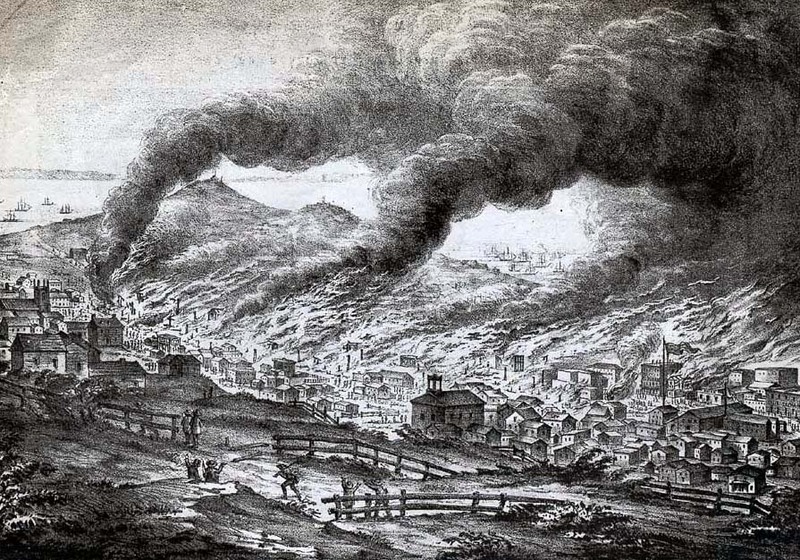 *Fire image is actually from the 1851 fire, not this 1850 fire. Clay street, south side, corner of Kearney, occupied by Osborne & O’Donnel, grocers, Building owned by Finley, Johnston & Co. Total loss. Clay street, on both sides from the above to Montgomery street, and on the south side to the bay; burning all the new houses recently erected on the former burnt district from the Plaza to Montgomery street, except one. Montgomery street, on both sides from the south side of Clay street to California street, except the large brick building owned by W.H. Davis, and occupied as the custom-house. Sacramento street, on both sides, from Kearney street to the bay, including the large iron ware-house owned by Cooke, Baker & Co., and occupied by the Empire City Steamship office. 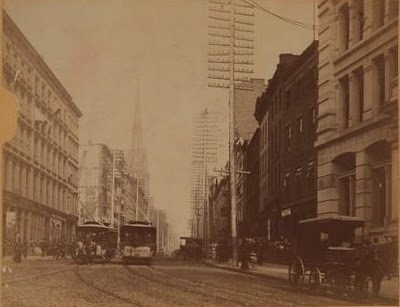 California street, on the north side, from Kearney street to the bay, except the custom-house building, as before mentioned. Kearney street, on the east side, all buildings from Clay to California street. Central Wharf — All the buildings on this wharf and the street leading to it, including the large warehouses of Mellus, Howard & Co., Finley, Johnson & Co., and D. Gibb. Sherman‘s building, corner of Montgomery and Clay streets, was for several hours in imminent danger. 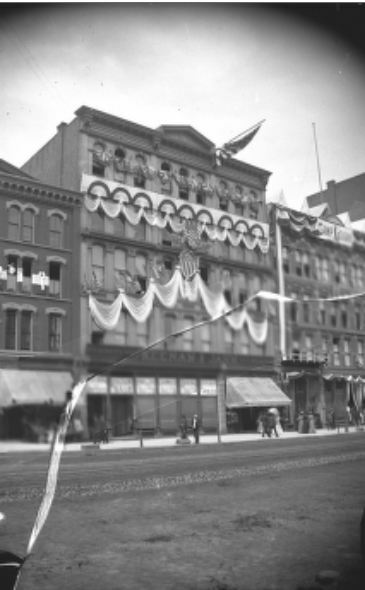 This building was occupied by Green & Morgan, Melhado, Klancke & Co., J. Mattoon & Co., on Clay street, and by Fay, Pierce & Willis, Bacon & Mahoney, R.J. Stevens & Co., and R.M. Sherman, on Montgomery street. 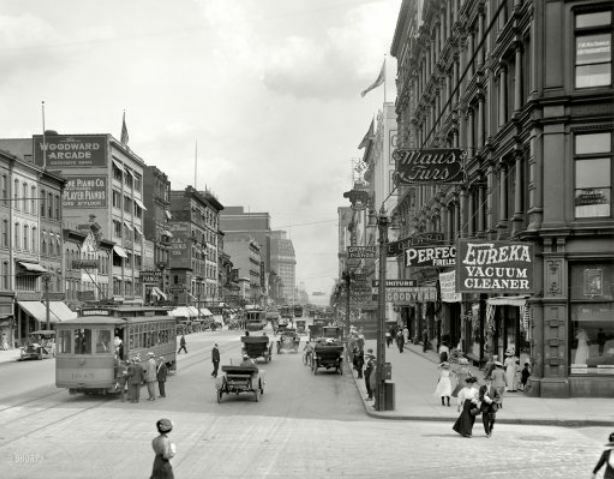 The occupants, with a host of good men and true, concentrated all their force to save that building, on which hung the fate of the entire block bounded by Clay, Montgomery and Jackson streets. The Herald says over three hundred houses were burned, and estimates the loss at more than three million dollars. It gives a list of the sufferers, and among them we observe the names of Vandyke & Belden, to the amount of $30,000, who were also sufferers by the previous fire to the amount of $20,000. Great credit is awarded to Col. Jack Hays, to whose exertions is attributed the salvation of the whole block bounded by the north side of Clay street, and from Montgomery street to the water. This is pretty amazing. I noticed in the article I posted (scroll down to the fire picture) mentioning the previous fire they also immediately started rebuilding. I suppose there was good and bad in that, probably could have used a bit more planning, but I don’t think that was how they did it back then. The editor remarks that “the enterprise of the citizens, although it has received a severe shock, has nevertheless not succombed beneath the misfortune;” and that in passing through the blazing streets, an hour and a half after the fire had been subdued, he saw carpenters already at work relaying the foundation of a building that had been torn down but two hours before; and various contracts to have buildings immediately erected had been even then concluded by some of those who had suffered heavily by the fire. Artesian wells are to be sunk, reservoirs constructed, and hook and ladder and engine companies are to be organized for the purpose of preventing a recurrence of such a dreadful calamity. From the San Francisco Herald of July 28. San Francisco is rising like a phoenix from its ashes. This day fortnight, the fairest and most important part of the city was a heap of smouldering ruins, and sadness and gloom were depicted on the countenances of all our citizens. To-day there is to be seen springing up, on the very sites of those ruins, buildings that in substantiality, size, and even magnificence, might favorably compare with those of any other city in the world. The smoke was still curling from the charred rafters, when the momentary depression caused by so sweeping a desolation was cast off, and the indomitable energies of our people set to work to clear away the rubbish for the new foundations. Nothing short of an earthquake, we believe, can cope with the energy and enterprise of our citizens. This third, and we hope, last, conflagration, however, has taught us a good lesson: and we are not without hope but it will be productive of great and lasting good to the community. — The most efficient measures have been adopted, not only to guard against recurrence of fires in the future, but to promptly extinguish them before they have become unmanageable. A fire department has been organised, permanent reservoirs of water have been prepared at convenient distances throughout the city, and every means taken that the prudence and intelligence of our citizens could devise for the prevention of similar disasters in future. Besides, the most of the buildings now in process of erection are of brick and fire-proof, and several of them have wells dug in them, and are supplied with a fire apparatus. Indeed, it seems hardly possible, with the means now at our disposal for extinguishing fires, that this destructive element will ever again, to any considerable extent, destroy the property of our citizens. In the course of a walk yesterday afternoon over the scene of the late calamity, we made a few notes of the progress that has been made with the various buildings in process of erection, which we shall briefly detail. On the north-west corner of Montgomery and Clay streets, Messrs. Vandyke and Belden, general merchants, are building a large three story fire-proof brick building, with a frontage of sixty-nine feet on Montgomery street and fifty-five feet on Clay. The lower rooms are to be occupied as stores and the upper rooms as offices. The building will probably cost about thirty thousand dollars, and is to be completed on the twenty-fifth of next month. All the buildings to be erected between Clay and Sacramento streets, as well as those in the rear of Clay and Commercial streets, much be of brick, as Messrs. Howard & Green, who own the lots, have made that a condition in the deed of sale. During the course of our inquiries we were struck with astonishment at the immense increase in the value of property in San Francisco in the short space of three years. In 1846 and ’47, a fifty vara lot could be purchased in any part of the city for fifteen dollars. In the late sales the land brought from seven hundred to nine hundred dollars per foot! and this is much less than could be obtained for it a short time ago. We cannot close this article without referring to the progress of the public improvements which have been referred to. There are three artesian wells and four reservoirs in process of construction. The artesian wells are being constructed in the following localities. One in Portsmouth square; one in California street near the custom-house, and the third at the intersection of Dupont and Pacific streets. Mr. Eddy has the contract for their construction at 12 per perpendicular foot, the bore to be six inches in diameter. The one in the center of the square has been bored to the depth of sixty feet, and it is expected, we have been informed that the boring must proceed to the depth of 200 feet, before a sufficient supply of water will be obtained. Each of these artesian wells is to have a fountain. The fountain in the square is to be twenty-five feet in diameter, and to have a dozen jets of water in continual play. The basin is to be finished with fine cut stone coping on the top of the brick walls, and to be surrounded with a handsome ornamental iron railing. The other two fountains are to be twelve feet in diameter. These artesian wells are intended to supply the four reservoirs which are being constructed a short distance from them, with an abundant supply of water, so as to meet any emergency. The one in the square is intended to supply the reservoir of the square, and the one at the intersection of Washington and Montgomery streets. The reservoir near the Custom house in California street, is in the form of an ellipsis, thirty-six feet by twenty-four, and is calculated to contain 3,000 gallons of water. It is to be arched with substantial brick walls laid in Roman cement. The entire depth reached last night, was fourteen feet. At this depth three feet of water was obtained. There are to be two apetures, through which to introduce the suction hose of the engines. The reservoir at the intersection of Dupont and Pacific streets, is to be in the form of a circle, and is to be 24 feet in diameter, and to contain 25,000 gallons of water. A depth of 18 feet has been reached, but no water has yet been obtained, nor is any expected. The one on the square is of the same size and is to be covered iwth timber. That at the foot of Washington and Montgomery, is to be a square cistern and to contain from 10 to 15 thousand gallons. It is to be covered with timber. These works are to be completed in three weeks from this time. Mr. John Cochran has the contract for the reservoirs in the square, and the corner of Washington and Montgomery streets. We understand he is to receive $14,500 for the two reservoirs. Messrs. Timmons and Stewart have the contract for the other two reservoirs and the ornamental fountain on the square, and are to receive $9000 for each reservoir, and $3375 for the fountain. It is calculated that these works when completed will cost $50,000, and that the reservoirs will contain a supply of $100,000 gallons of water. Other improvements both of a public and private nature are contemplated, which we shall refer to on a future occasion.